Not All Those Who Wander Are Lost: Black Acrylic socks . 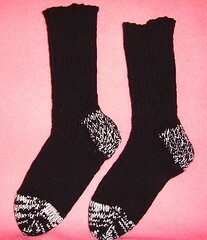 . .
Black Acrylic socks . . .
. . . for my sfil. We couldn't leave him with cold feet now could we? These socks are 100% Acrylic with white Nylon added at the heels and toes. More Spring pictures . . . .